This tutorial will review the Module Manager in Drupal and what it offers. With Drupal, it is easy to manage and use modules on your website. There is a great list of available modules that offer different functionality so it is a must to know how to use the Module Manager. To access the Module Manager, you need to log into your website as administrator and then navigate to the Modules tab from the main menu. 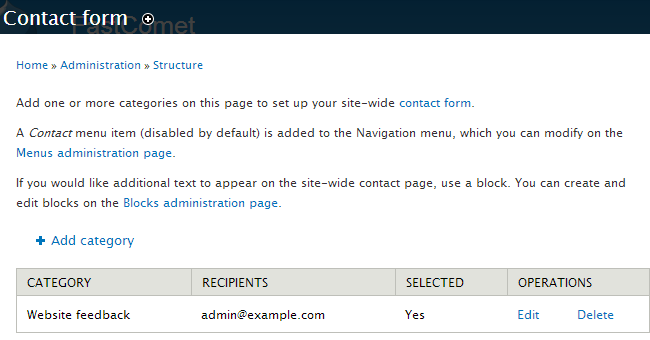 To enable a specific module on your website, you will have to locate it first. In our case, we will enable the Contact module. Check the enabled box next to the module. Scroll down to the bottom of the page and click on the Save configuration button. The process for disabling of a certain module is the same. However, this time, you need to uncheck the Enabled box next to your module and then click on the Save configuration button to keep the changes. Once a module is enabled on your website, you will be able to configure and use it as per your exact needs. Of course, you should make sure that it even provides the functionality that you are looking for. For the purpose of this tutorial, we will use the Contact module. You need to make sure that the module is enabled. Then click on the Configuration button next to the module. Edit the available options for the module.